Well, Rani Mukherjee is back on the silver screen after her marriage with producer-directer Aditya Chopra with the release of Mardaani trailer. She will be playing a tough cop Shivani Shivaji Rao from Mumbai Crime Branch in this social thriller. From the trailer it is very clear that the movie will be dominated by Rani’s powerful performance and it could fetch her awards too. The plot also looks promising which deals with the major social issue of child trafficking in our country. A teenager Pyari’s kidnapping leads Shivani into the darker realm of this trafficking mafia in Mumbai. The movie is directed by Pradeep Sarkar (director of Parineeta) who has worked with Rani in Laaga Chunari Mein Daag previously. 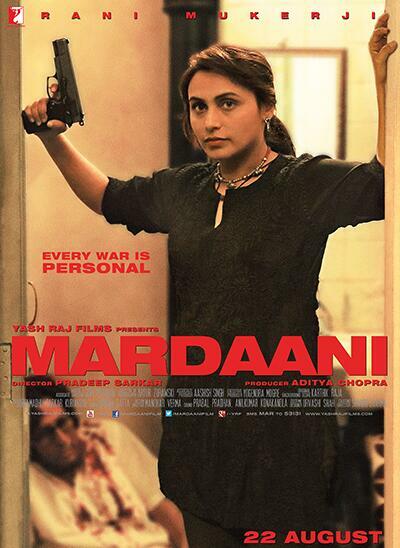 Mardaani is produced by Aditya Chopra and presented under the banner of Yash Raj Films. It is slated to release on August 22 2014. The supporting star cast includes Jishu Sengupta as Rani’s husband and Tahir Raj Bhsin as the antagonist of the film. As this year is heavily dominated by newcomers like Alia Bhatt, Shraddha Kapoor, Parineeti Chopra and Sunny Leone, so will Rani be able to make a mark ? What do you think? Give your verdict on Mardaani Trailer. Rani Mukherji and Aditya Chopra welcome a baby girl into the world! Yes the trailer looks interesting and the subject line is good too. Overall the movie looks promising… Wat Say? ?